“I have raced the London mini-marathon five or six times and I have won about three times. Obviously I wanted to be selected and I understand, but I was told that the people who are carring it aren’t actually from the Borough and that is one thing that isn’t good,” Jack said. Jack lives his life with a positive attitude. Having brittle bone disease, his humour and determination has seen him in a TV role in Bad Education, pose alongside David Beckham this week and feature in an Adidas campaign across Kingston. His parents, Penny and Graham Binstead brought him up to be his own person. “Many children with brittle bones are wrapped up with cotton wool because their parents did not want them to actually feel the pain. We have always brought Jack up to enjoy life and not to be frightened about what could happen,” Penny said. Penny claims that contact with world class athletes like Paralympian David Weir has also given Jack a chance. 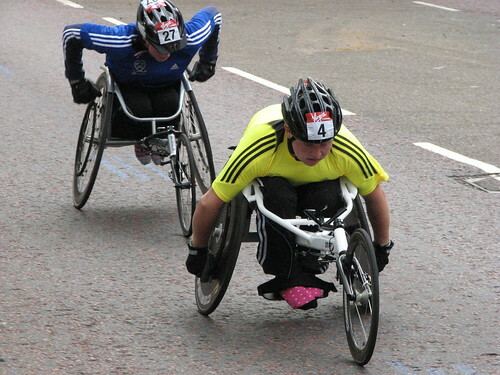 Currently eighth fastest wheelchair racer in the UK, Jack has a quicker under-16 time than David Weir at that age. Tributes to his grit have come through the honour of a Children of Courage award and being made an ambassador for the Brittle Bone Society (BBS). To the modest Jack the news of being nominated was stunning. “I got a call from my Mum and she said to me that a nurse from the hospital where I was when I had broken bones put in a nomination for me and it got accepted,” he said. But then a Lloyds TSB nomination letter arrived with a rejection and no explanation. They had turned him down. It was even more surprising given that Jack was appearing in the Olympic brochure. “Jack was actually in the Cultural launch booklet advertising him as a potential for the 2016 Olympics,” she said. Only three years later, Jack feels he would benefit from an explanation from Lloyds TSB about why he was not selected. “I am just hoping in the back of my mind that the reason that I didn’t get it was a fair reason as to why, and that they didn’t just decide they didn’t want me for whatever reason they could think of,” Jack said. Especially so given that LOCOG has fallen over 1,000 places short of its goal to allocate 50% of torchbearer places to young people. “Obviously it’s a very expensive sport so being in the torch relay would have got me recognition with a possible chance of sponsorship,” Jack said. “Travelling to competitions is expensive, as is equipment. Chairs are all custom-built, taking into account the size and weight of athletes, with seating positions accurately measured to ensure they are stream-lined. “Our tyres puncture easily and we are going through gloves pretty quick, they are a lot of money and they last only a few months,” he said. No wonder with all the hard work this year, training five times a week as well as GCSEs. Jack’s school photograph, pictured the racer alongside the Chair of LOCOG, Seb Coe. It was taken last April 2011, during a school visit by the former Olympian runner. “I’m thrilled to have visited Chessington Community College today and seen for myself how inspired its students are by the London 2012 Games,” Coe was reported as saying. For Jack ‘inspire’ misses the mark, when the reality is of course that Jack and his family were flying out of Kingston on relay day in order to escape the bunting and flag waving. This entry was posted in interview and tagged Jack Binstead, lloyds tsb, locog, sponsors, Torch relay, torchbearers by carolmiers. Bookmark the permalink.